Held according to the lunar calendar, in memory of the saint Khwaja Moinuddin Chisti, helper of the poor, Urs Ajmer Sharif - celebrated at Ajmer - is one of the biggest Muslim fairs in India. The six days that the saint is said to have gone into seclusion, to shed his mortal coil off and fee his soul, are dedicated to his memory and pilgrims converge here from within India and al over the world. The lakeside city of Ajmer is located in central Rajasthan, and is held in great reverence by devotees of all communities who call it 'Ajmer Sharif' (Holy Ajmer). 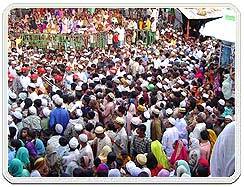 It is here that the mortal remains of the highly respected Sufi saint Khwaja Moin-ud-din Chishti lie buried. The Khwaja came from Persia and established the Chishtia order of fakirs in India. He is popularly known as Gharib Nawaz (protector of the poor) because he dedicated his entire life to the service of mankind. His spartan life spanned almost a hundred years and he embraced death in solitude while he had withdrawn to his cell for six days, asking not to be disturbed. The Dargah Sharif in Ajmer is the place where the Saint's mortal remains lie buried and is the site of the largest Muslim fair in India. 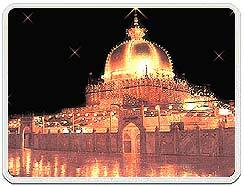 More than five lakh devotees belonging to different communities gather from all parts of the subcontinent to pay homage to the Khwaja on his Urs (death anniversary) during the first six days of Rajab (seventh month of the Islamic calendar). The pilgrims who come to seek the blessings of the Khwaja make rich offerings called nazrana at the holy spot where the saint has been entombed. The offerings of rose and jasmine flowers, sandalwood paste, perfumes and incense contribute to the fragrance that floats in the air inside the shrine. Also offered by devotees are the chadar, ghilaph and neema, which are votive offerings for the tomb. These are brought by devotees on their heads and handed over to the khadims inside the sanctum sanctorum. Outside the sanctum sanctorum of the dargah, professional singers called qawwals in groups and sing the praises of the saint in a characteristic high pitched voice. People gather around them and listen attentively, sometimes clapping to the rhythm of their instruments. An interesting ritual is the looting of kheer (milk-pudding) which is cooked in two large cauldrons called degs and distributed to the devotees as tabarruk (blessed food). On the 6th of Rajab, after the usual mehfil and the sound of cracker-bursts accompanied by music, the Sajjada Nashin performs the ghusal of the tomb. Fatiha and Salamti are read. A poetic recitation called mushaira is arranged in which poets of all communities arrive to recite compositions dedicated to the Khwaja. The Qul (end-all) on the 6th of Rajab marks the end of the Urs. 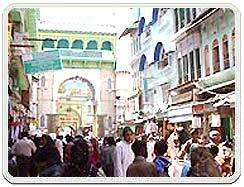 The Dargah is located at the conjunction of three bazaars. There are a number of restaurants around the Dargah where visitors can choose from a variety of dishes most of which are non-vegetarian preparations. Guest houses on the road leading to the Dargah offer accommodation that ranges from economical to luxurious. Many other guest houses are strewn across the city. The shops in the market around the Dargah sell flowers, prayer mats, rosaries, textiles, and general merchandise as well.